90 Secondi. 400 Gradi. These are Johnny Di Francesco’s two pizzeria e cucinas located in the Docklands and East Brunswick, respectively. However more significantly, they aptly represent di Francesco’s philosophy behind cooking the best Neapolitan pizzas. 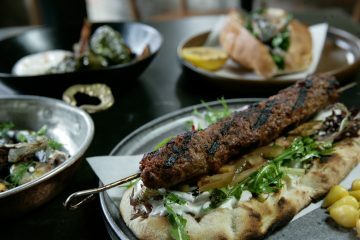 400 Gradi provides a welcome reprieve to the standard fare of pizzas that are abundantly available in Melbourne’s culinary scene. Its location north of the “traditional” end of Lygon Street reflects di Francesco’s different, yet ironically more traditional approach to making pizzas. 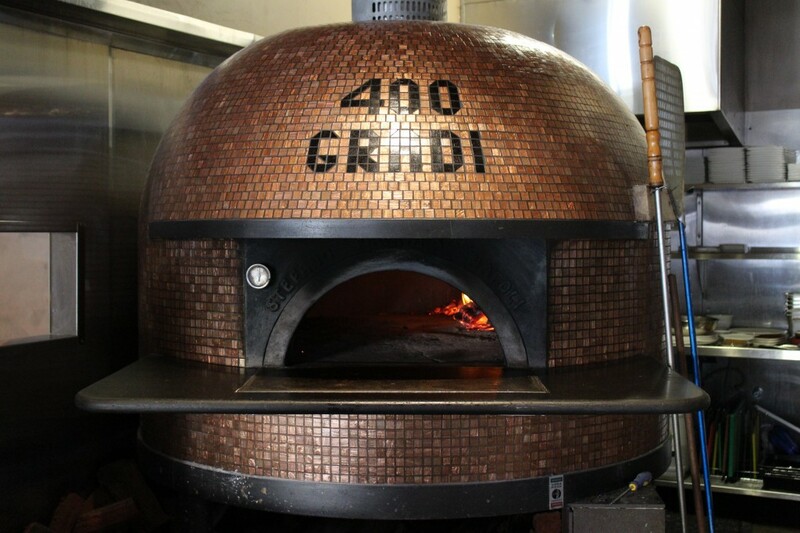 400 Gradi’s Margherita Verace showcases di Francesco’s traditional Neapolitan pizza. This pizza accords to the strict standards applicable to Traditional Speciality Guaranteed (Specialità Tradizionale Garantita, “STG”) products in Europe. 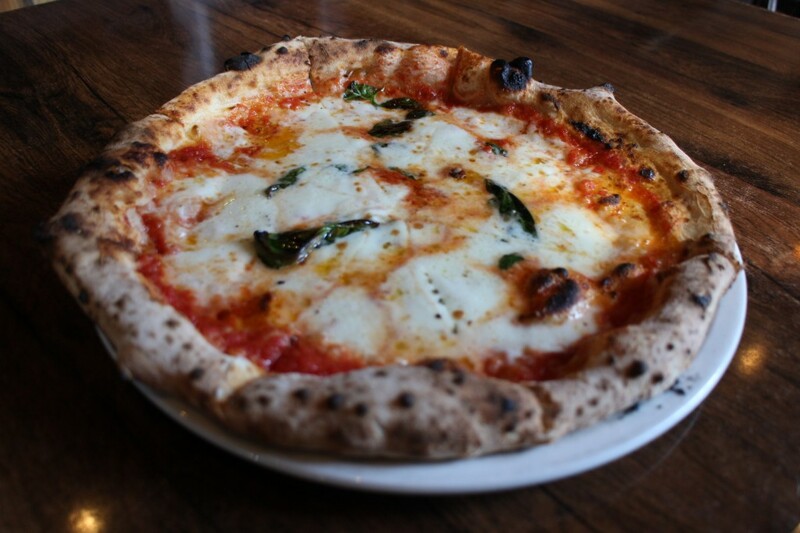 Neapolitan pizzas are only STG compliant if they include San Marzano tomatoes, buffalo mozzarella and basil. Central to di Francesco’s philosophy is that the pizzas must be wood-fired, oven cooked at 400 degrees for 90 seconds, starkly contrasting against the widespread and ordinary method of baking pizzas for 5 minutes. These oven conditions, as well as a distinct, specialised manipulation of the dough, create a pizza base that retains moisture and provides soft and fluffy texture. Although the pizza base is soft and thin, it does not suffer from undue sogginess, and is sufficiently crispy on the sides, such that it lacks the flaky, biscuit-like crunch that many ordinary pizzas have. The cooking method also allows the toppings to be adequately cooked, without become overtly crispy and burnt, manifest in many other pizzas after spending too much time basking in the oven. Consequently, the Margherita Verace’s toppings retain its natural texture, colour and flavour. The buffalo mozzarella (air-freighted, fresh from Caserta, Italy) is sufficiently melted, and exhibits a smooth and silky consistency. The basil and tomatoes nestle between pulls of mozzarella. This is not a pizza consisting of charred remains and burnt flavours. This is one with its topping’s flavours and fragrance permeating throughout the pizza. Di Francesco takes his Neapolitan heritage seriously. His STG pizzas comply with the Verace Pizza Napoletana (“VPN”) rules, which set the standards for the best Neapolitan pizzas in the world. Being the first Australian pizzaiolo trained to the VPN rules, di Francesco is the VPN association’s principal for the Australian branch on the VPN association. Although the pizzas are the real centrepiece at 400 Gradi, the menu reflects the traditional cuisine from Naples, embracing fresh seafood due to the town’s coastal location. 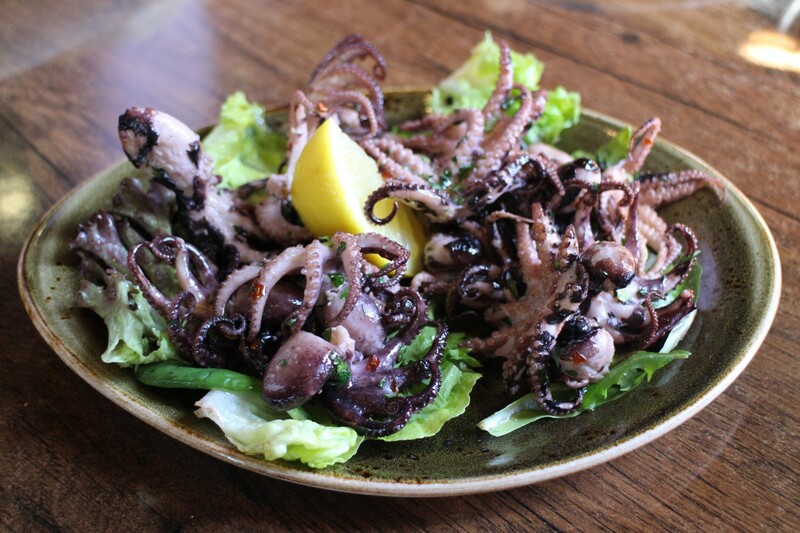 One of the star starters is a simple plate of baby octopus, presented in its rustic simplicity, doused liberally with olive oil, and a hint of chilli, basil and lemon juice. 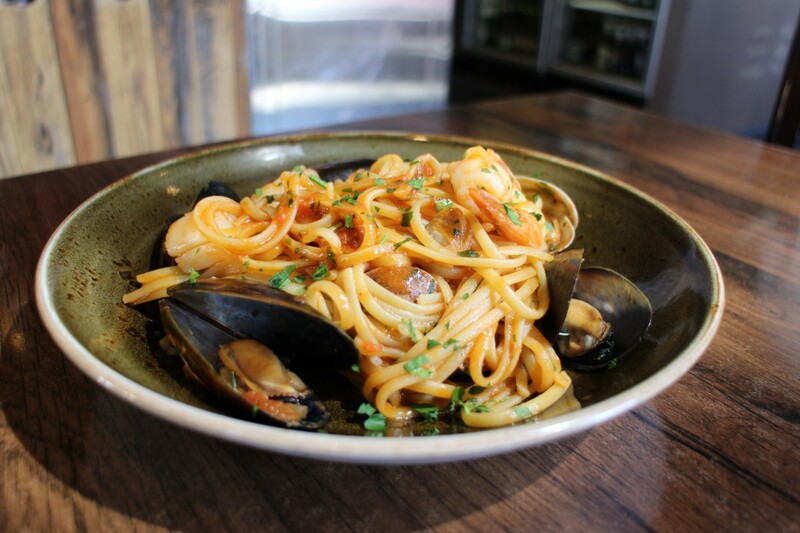 The coastal theme is further carried into one of the pasta dishes, the linguine pescatore. Consisting of fresh local seafood with an olive oil and garlic base, the dish contains the light saltiness and freshness from the sea. The linguine is cooked perfectly al dente, retaining a certain delightful “bounce”. Dessert rounds off a pleasant experience at 400 Gradi, with an inventive twist to a pannacotta. 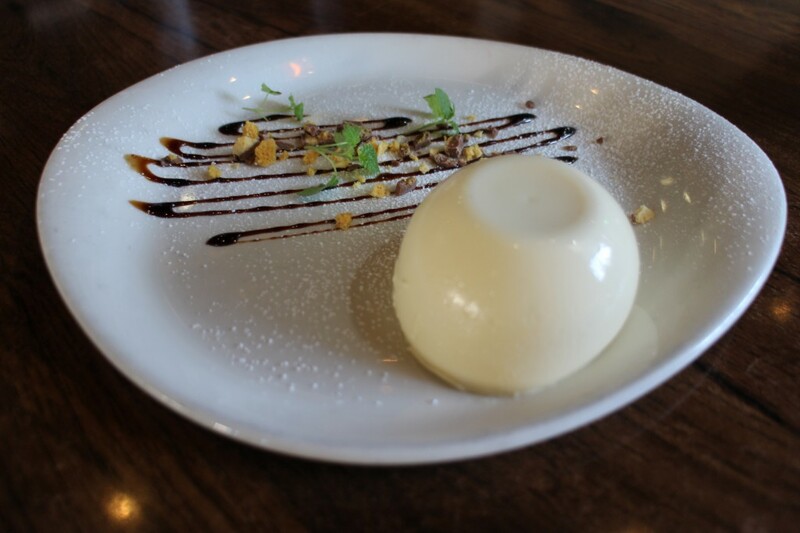 The panacotta al miele is a honey pannacotta with sticky vincotto, chocolate honeycomb crumble. The pannacotta is smooth and light, and the vincotto’s acidity provides the appropriate balance to the sweetness of the chocolate honeycomb crumble. 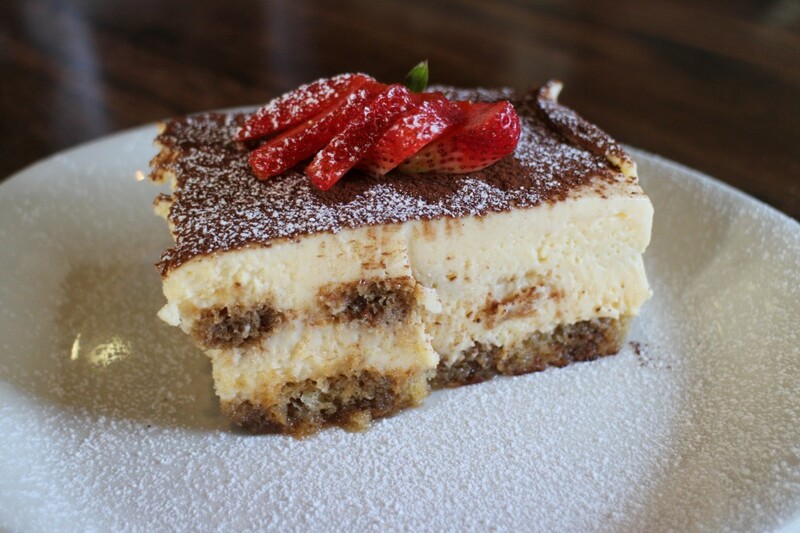 The tiramisu is also delicious, and it is obvious that care and precision was placed in the dish. The layers of sovoiardi are soaked well enough with coffee liquor that it does not suffer from excessive moisture, ultimately retaining its texture. 400 Gradi seats 250 people, but the design of the restaurant creates an illusion of intimacy by having the kitchen (and appropriately the wood-fired, brick pizza oven) at its heart, and the corridors of tables enclosing the kitchen. Because of this layout, one section of the restaurant can be easily partitioned, creating a private function room. Upstairs, there is a separate dining room that sits roughly 70 people. 400 Gradi’s sister, 90 Secondi is smaller, seating 130 people. 90 Secondi – 700 Bourke St, Docklands. 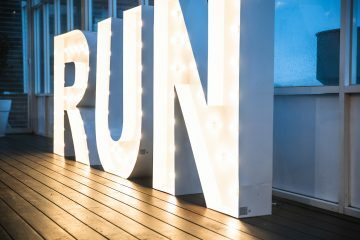 Open Mon-Fri, 7am to 11pm Sat-Sun, evening only, but open if there are events in the Docklands.